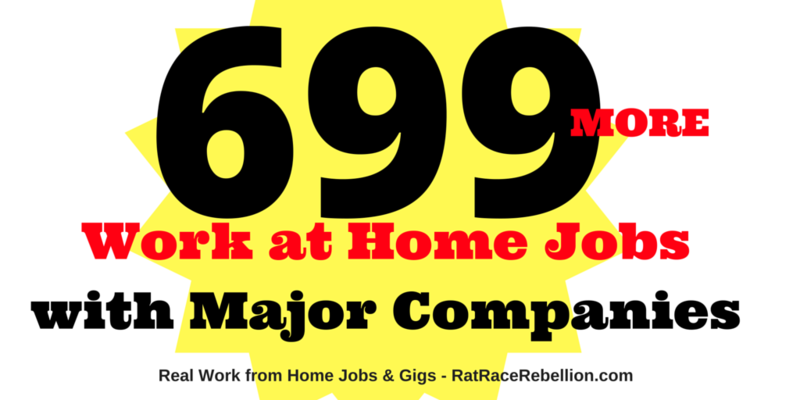 If you read yesterday’s post, 2,283 Work from Home Jobs with 5 MAJOR Companies – OPEN NOW, you know that there are some big name companies with really big work from home programs. Here are six more companies that are also hiring hundreds of home-based workers. Apple always has great work from home positions they offer through their “At Home” program. Currently, there are three primary types of jobs they offer home-based workers. At Home Advisors – Their customers’ first point of contact. Answer questions about Apple products and services. At Home Team Managers – Supervision of the At Home Advisor teams. Aetna employs thousands of home-based workers already, and they regularly have hundreds of telework positions open at any given time. Positions are diverse and include such openings as case managers, analysts, proposal managers, trainers, consultants, nurses, IT, management, and others. Another player in the healthcare sector. Like Aetna, Humana has a wide variety of work from home positions. They are often looking for RNs, and also hire for management, IT, sales reps, case managers, and other jobs. ADP is one of the largest business outsourcing companies in the world and they always have some home-based positions available. Openings include sales managers, relationship managers, consultants, IT and other positions available around the world. With over 1 million students worldwide, Kaplan is one of the world’s largest education providers. They always have a variety of remote positions posted to their career page, including faculty, program managers, student advisors, IT, content developers, and more. About.com is the largest source of expert content on the internet. They hire freelance subject matter experts to post information on thousands of different topics. At any given time, they have over 50 “Available Topics” they are looking to find experts for. Topics range from autos, careers, and education to movies, TV, food, health, home, and style.